The NdFeB magnet can be classified into the sintered magnet and bonded magnet. The former has superior magnet characteristics but the degree of freedom in shape is restricted, whereas the latter has a high degree of freedom, but its magnet characteristics are considerably inferior to the former. Also, when a NdFeB magnet is used at several hundreds℃, the magnet characteristics degrade with a decrease in coercive force, and so a magnet in which part of Nd has been replaced with a high-priced Dy is used. For this reason, there has been a desire to develop a Dy-free and high-performance NdFeB bonded magnet. Dr. Honkura tackled these problems, and developed a method that uses a thermally balanced furnace that manufactures magnet powder for the sake of making high-performance magnets. Furthermore, by applying mixing and diffusion treatment to magnet powder in order to increase the coercive force, high-performance NdFeB magnet powder that is Dy-free and has superior heat resistance (named as Magfine) has been developed. By means of a bonded magnet made by using this magnet powder, commercialization of a small-sized motor for automotive use has been realized. At present, commercialization for various types of motors is being deployed in addition to that for small-sized automotive motors, and it is expected that the market will be increasingly enlarged. The developed technology has realized Dy-free high-performance magnetic characteristics and is an important invention not only for energy conservation but also for rare element strategies. Due to the aforesaid reasons, Dr. Yoshinobu Honkura will be an awardee of the 12th Yamazaki-Teiichi Prize in the field of materials. Permanent magnets can roughly be classified into two types: NdFeB magnets and ferrite magnets, and into sintered magnets and bonded magnets in terms of the manufacturing method. NdFeB sintered magnets that were invented in 1983 have the performance of magnetic force that is 10 times as strong as that of ferrite magnets, contribute to quantum improvement in motor efficiency, and have become one of the important technologies that support industrial infrastructure. However, NdFeB sintered magnets pose a problem from the viewpoint of resources security because their coercive force is improved by replacing part of Nd with rare Dy as measures against demagnetization due to temperatures or opposing magnetic fields. Also, sintered magnets are subject to great restrictions in terms of shape, which have become one of the restricting conditions in the development of next generation motors. Instead of NdFeB sintered magnets, it is desired that NdFeB anisotropic bonded magnets that have high performance and a high degree of freedom in terms of design and besides that do not use Dy be developed together with next generation motors that utilize such magnets. The development of NdFeB anisotropic magnet powder has been tackled since the 1980s on the basis of bonding and separation reactions between NdFeB alloy and hydrogen. 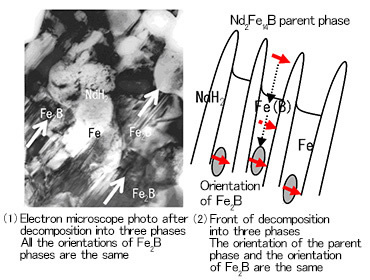 Absorption of hydrogen causes decomposition in 3 phases: NdFeB + H2→ NdH2 + Fe + Fe2B, and subsequently a release of hydrogen causes rebonding and minute NdFeB recrystallized texture is formed. In 1990 it was discovered that addition of Co elements results in occurrence of anisotropy after the reaction, and the discovery was formulated as the HDDR reaction. However, the reaction was very unstable and commercialization was extremely difficult. Besides, elucidation of the mechanism of this mysterious phenomenon was not advanced, either. In this d-HDDR reaction, the basic characteristics of anisotropy and coercive force show contradicting behavior. According to the theory of memory in the Fe2B phase, slow reaction over a long period of time is important in securing anisotropy, but it is desirable that with regard to coercive force, minute crystalline texture and Nd-rich grain boundary phase be formed in a short period of time. Hence, the reaction processes were implemented using different furnaces by dividing the processes into three according to the function. With regard to the important d-HDDR reaction, reaction speed was regulated strictly by means of a heat balance furnace, whereby anisotropy and minute crystalline texture structure were realized. In the final complete dehydration process, mixture with NdCuAl alloy was done by using a rotational kiln furnace, diffusing Cu and Al and forming an Nd-rich phase containing Cu and Al in the grain boundary, whereby substantial improvements in coercive force were made as shown in Fig. 3. As a result of this, excellent NdFeB anisotropic magnet powder that does not use Dy and is 40 MGOe in BHmax and has a coercive force of 18 kOe (which was named as Magfine) was developed successfully. With regard to problems of miniaturization and weight reduction of automotive small-sized motors, weight-reduction designs were tried in all the magnets including NdFeB magnets, ferrite magnets, etc., and consequently miniaturization and weight reduction of 1/4 (Fig. 4) were realized. A motor that surpasses conventional motors in both aspects of performance and cost was successfully developed. In the field of high-output motors, it was a problem whether the same power and efficiency as those of NdFeB sintered magnets can be realized by using Magfine whose magnetic characteristics as a single magnet are inferior to those of NdFeB sintered magnets. The conventional design method took measures against demagnetization due to temperatures or opposing magnetic fields by increasing the coercive force of the magnet. Honkura et al. has clarified that the measures can be taken by improving design, and has proposed a new type of design. It has already been demonstrated by prototyping that such problem can be solved by making an ideal motor design by utilizing the degree of freedom in design in fields such as those for air conditioners, power-driven bikes, etc., and commercialization is scheduled in next year. With regard to research of d-HDDR hereafter, anisotropy is around 80% at present, and research for the anisotropy improvement to 90% or more is ongoing. It will also be not just a dream to manufacture magnet powder that surpasses NdFeB sintered magnets, which will be 20 kOe in coercive force and 45 MGOe in maximum energy product. In terms of practical application, Magfine is commercialized in numerous fields such as a magnet that enables high-output and miniaturization for automotive seat motors, ABS motors, rear wipers, power-driven tools, motors for welfare equipment, etc. in the field of small-sized motors. 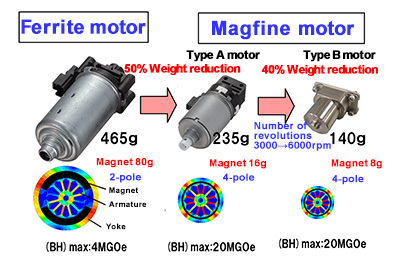 Also, in the field of high-output motors, Magfine is partially adopted in power-driven bikes, and from now on it is expected to win competition with NdFeB sintered magnets in air conditioners, refrigerators, washing machines, EPS, power-driven agricultural equipment and tools, EV motors, power generators, etc. Although the product volume at present is 40 tons per month, it is expected that the quantity of its use will rapidly be enlarged to 10,000 tons or more in the near future. The Dy-free NdFeB anisotropic bonded magnet will become one of the three major magnets including the ferrite magnet and NdFeB sintered magnet, and is expected to become the basic magnet for next generation motors.